I wanted to tell a mermaid story this week, but I wanted it to be engaging for the many boys in our Page Presents class. I finally found the perfect story in the Japanese tale of “The Sea Queen and the Serpent,” in Mermaid Tales from Around the World, retold by Mary Pope Osborne and illustrated by Troy Howell. Toda, a young warrior is passing by, and he hears her plea for help. “I will do my best,” he tells her. Of course he does slay the monster, but is rather taken aback when the Sea Queen rides up on her green dragon. But she soon reveals her true identity and invites him to her palace in the World Beneath the Waves. There they are greeted by sea fairies wearing gorgeous headdresses of living sea creatures, which snap their claws, wave their tentacles, and click their shells as the sea fairies dance for the Sea Queen and her guest. The Sea Queen rewards Toda with casks of rice, jars of wine, silken robes, a mighty sword, and a great bronze bell. He soon discovers that the barrels of rice and the jars of wine are always full, the robes never wear out, and the sword vanquishes every foe. The bronze bell can still be heard today. It is said that, when it rings, you can sometimes look down through the water and see the Sea Queen’s palace in the World Beneath the Waves. I had made puppets of the Sea Queen and Toda from the Noreen Crone-Findlay’s pattern for Flat Fanciful Dolls. She made hers out of wood, but I used a double thickness of manila folder. I had to use yarn for their hair, because I didn’t have time to look for my embroidery floss (in deep storage!). Then I designed some clothes for them from origami paper, but I gave them both the elegant short kimono designed by Noreen Crone-Findlay. I found a trident swizzle stick for Toda’s weapon, and I gave the Sea Queen a golden fan and a clamshell hair ornament. My red dragon puppet played the part of the terrible sea serpent, Ja, and I had planned to use a green eel for the part of the green water dragon. But when I got to that part of the story, Page the Bookworm piped up and begged for a part. So I wrapped him up in lime green crêpe paper, and he made a fine water dragon! While planning the craft, I happened to run across some paper plates left over from my very first story-time last fall, when I had to fill in for a colleague and we made bat hats. As I picked them up, the fluted top of the plate reminded me of a shell, and the shape at the bottom made me think of a Mardi Gras mask. Voilà! Embellished with some of the clip art provided by the Collaborative Summer Library Program, they would look very much like the headdresses worn by the sea fairies in the story. The kids enjoyed this craft a lot, even the boys, and they were all eager to have their pictures taken. Many of the sea creatures on their masks actually did move around quite realistically since the air conditioning was running full blast. I wish I had thought to bring the recording of The Aquarium from Saint-Saëns’ Carnaval des Animaux. I’ve used this piece with the children before, and it really seems to appeal to their imaginations. It would have been so cool to have them re-enact the dance of the sea fairies in the World Beneath the Waves. Remember the origami boat regatta and the boat haiku project? Our original idea had been to place the boats with haiku among the book collection for patrons to discover. But several coworkers thought they should be displayed where everyone would be able to see them, so here’s what we did with them! Entangled in fishnet, the boats spill from the ledge over the “fishbowl” window of our branch manager’s office. Our weekly Summer Reading Program origami workshop last week was our first program designed for teens. Up until now, we haven’t done much to attract teens. Until recently the Young Adult area was located right next to the librarians’ desk in the Youth Services room (who was responsible for that idea???). For a while, we were waiting to for the branch renovation project scheduled for fall to relocate it. But even before we found out that the renovation had been canceled, we decided that we had to do something to make a more inviting teen area. We moved the YA area to a small narrow space nearest the adult section of the library. Somehow we managed to squeeze in a couple of armchairs and decorated with some origami and lo! suddenly there were teens browsing and hanging out there! We also had good luck in recruiting a lot of teen volunteers for the Summer Reading Program, so we definitely need to make good use of this “first contact” with the young adults of our community. 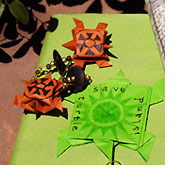 So I came up with the idea of an origami workshop to make origami turtle earrings and journal covers. Then I waited like a hunter in a blind to see if any teens would take the bait. Unfortunately, my camera picked that moment to run low on batteries, so most of my photos didn’t turn out. But the girls’ earrings were indeed awesome, and I think they’ll be back. Zo om Away, by Tim Wynne-Jones and illustrated by Eric Beddows, was our featured book this week for our Page Presents: Learn with Stories, Music, Art story-time class. My best laid schemes ganged agley, since I had planned to coach the kids on “reading” pictures by projecting enlarged images. With my new puppet who greatly resembles Zoom, I had planned to read parts of the story and get Zoom to narrate other parts. But we couldn’t get the projector to play nice with either of our available computers. Curses! I hope we can get some equipment that works, since I’m planning to feature Zoom Upstream in a few weeks. But Mr. Matt’s Minute was great as always! This week my boss (Celtic harpist) and I (flutist) played a jig and a sea chantey, and Matt had the kids jigging and then hauling away on a rope with gusto! Everyone loved having live music too. I’m teaching a weekly origami workshop at our library for the Summer Reading Program. Last week we made origami pirate hats. The Samurai Pirate model was the most popular, followed by the traditional pirate hat. Or a combination of the two! Only one kid wanted to make the African kufi hat, which was my personal favorite. Like Captain Barbossa, most pirates seem to prefer “a really big hat.” But I have to admit that the Samurai Pirate is a great look! Then, of course, we also had the Fashion Pirate, a little girl dressed in pink with a striped heart on her knit top, sporting a matching striped pirate hat. Très chic, aaaaaaaaaaaarrrrrrrrrghhhhhhhh. That’s what one of the parents told me after this week’s Page Presents story-time class. How cool is that? I got to unleash my inner Pirate for two days in a row, because I led a library tour/story-time for kids from a nearby day school on Thursday, and I had our weekly Page Presents story-time class on Friday. Mr. Matt got everyone in the mood by leading the kids in a rousing chorus of pirate talk, including “Aaaaaarrrrrrrrrgh!” “Shiver me timbers” and “Swab the deck!” We explained that sailors sang to help pass the time and also to make sure that everyone hauled on the ropes in unison. We taught them the refrain of Haul on the Bowline and gave them a rope to hold as we swayed back and forth to the beat. Then we got them to practice their swaggering and swashbuckling to The Coast of High Barbary. Our featured story was The Pirate’s Parrot, by Lyn Rossiter-McFarland and illustrated by James McFarland. The seeing-eye parrot of Captain Cur has dropped dead, and the grieving captain has dropped — and accidentally crushed underfoot — his monocle. This renders him nearly blind, which is why he doesn’t notice that the package his bungling sailors steal as a replacement contains a teddy bear, not a bird. His quick-thinking quartermaster explains that the crew’s laughter is “the dreaded giggle of fear” inspired by this strange new “fur-feathered, sharp-toothed, beady-eyed buzzard of a bird.” Down below, the teddy is about to be tossed into the sea when it begs for its life and is taught its duties as the captain’s bird. It’s a great story, with ample opportunity for growling, swaggering, and swashbuckling. Afterwards we made pirate hats and eye patches. 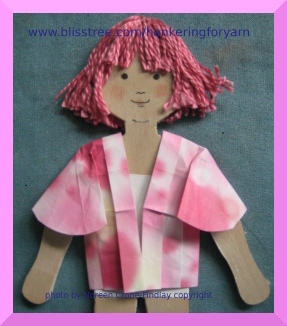 These simple crafts were easy for the kids to make themselves, and they loved wearing them. I had been a bit worried that our regulars in the Origami Cool Zone might find simple boats too elementary and not sufficiently challenging. But how could i forget that one of the many charms of origami is the simplicity, elegance, and frugality of the traditional designs? Like music, paper folding is an art that transcends language and allows people to connect through a shared experience. We had our usual large crowd for the Origami Cool Zone. And the boats were a big hit! It was an extremely hot day, but quite a few people — and all of the kids — took their boats outside to test their seaworthiness. We had set up two large tubs full of water, and we passed out straws so people could blow their boats around. There was an intermittent stiff breeze that also kept the boats in motion. Playing with boats is amazingly relaxing. Everyone was enjoying themselves so much that we had a hard time getting them to leave at closing time. Q: Is an origami boat a document? A: Yes, it is a document when a haiku is written on it! My colleague Anne and I had been talking about the necessity of committing random acts of whimsy, and we came up with the idea of getting people to write haiku on their boats so we can place them around the library for our patrons to discover. I had my doubts about whether this would work. Would the origami enthusiasts be willing to pause before learning to fold another boat model and (possibly) use a completely different part of their brains to compose a three-line seventeen-syllable poem? With much scribbling and counting syllables on fingers, they tackled haiku composition with the same care and energy that they bring to paper folding. I brought the boats home to document before placing them around the library. Here are some of their creations! I like my cool boat! On a hill at dawn. My white boat and me. Shark hats were one of the activities suggested in the packet of materials we received from the Collaborative Summer Library Program. This hat can be made to fit a variety of head sizes by changing the distance of the first folds from the center line, as you can see from the photo of a mother and her daughter modeling their hats. I really liked the contrasting hat styles worn by this grandfather and grandson. Check out the gallery below of shark hats @ the library! Make a Splash @ Your Library! —— We kicked off this year’s Summer Reading Program with a splash last Saturday! We had a great program by Albuquerque’s Water Utility Authority in the morning, followed by the making of shark hats after lunch, followed by the regular monthly meeting of the Origami Cool Zone and the folding of boats and composition of haiku, and the origami boat regatta. More about these events in my next posts! In this post I want to talk about our awesome oceanic decor throughout the library. My thirsty eyes wish we could leave it up forever and then maybe I wouldn’t pine so much for Puget Sound. My Orca mask is slung above the holds shelf, thrilling one and all. We must be one of the only libraries in the country with a large whale as featured decor for this year’s Summer Reading Program theme…and certainly the only one in the desert Southwest. 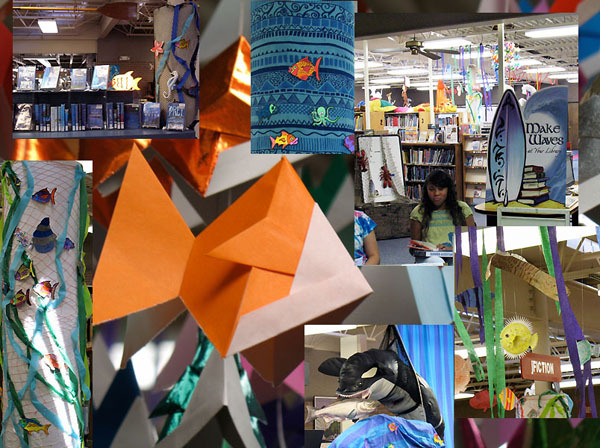 Check out a photo-montage of more aquatic decor at the Juan Tabo Library!